Looking back through the chronicles of history nothing demonstrates the beauty of using stainless steel in architectural artistic application better than the ground breaking roofing panel of the 1930 Chrysler building situated in New York. A stunning masterpiece that has withstood the test of time. In its 86 years of existence, it has only been cleaned two to three times with household grade cleaning agents. It has been aptly observed by many in the industry that the only limitation of using stainless steel cables in an artistic application is the imagination of the user. A great example of stainless steel cables used in artistic architectural application is the Wind Roundabout which is a dynamic stainless steel kinetic sculpture created by Ned Kahn, located in Fort Worth, Texas, USA. Ned Kahn is an environment artist and sculptor who likes to capture the invisible aspects of nature and make it visible. Including things like building facades that move in response to the wind, indoor tornadoes and other elements in nature that are hard to see. The wind roundabout stands at just over 9 metres tall. The cover which is made of the stainless steel cables and hundreds of aluminium rectangles is designed to move with the wind and reflect sunlight as well as the lights from passing cars. This then reveals the pattern of airflow over the roundabout and through the structure. Some of the main advantages of using stainless steel cables purely for artistic application is its durability, sustainability and cost effectiveness in design and build. Another benefits is that stainless steel doesn’t lose its colour during the shaping process. Stainless steel cables are also durable when compared to other materials. Many architects choose stainless steel cables for their corrosion resistance and aesthetic look. It is a versatile material, highly suitable for many building and constructional applications. What Makes Stainless Steel The Material Of Choice For Artistic Fabrication? The exclusive use of the stainless steel cables in areas that experience harsh climatic conditions is a living testimony of its ability to withstand corrosion. Stainless Steel has high tensile strength and excellent fatigue properties. It is suitable in hot and cold climates which makes it suitable in just about any environment. An example would be a green facade. Welded wire mesh is a versatile industrial product that can be fabricated into a trellis system to allow vine plants to grow vertically on it and cover your building. 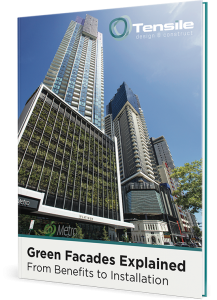 The ecological and physiological benefits of such green facade is a well-documented domain. Modern steel manipulation techniques mean that stainless steels can be cut, welded, formed, and fabricated as readily as traditional steels and other materials. Modern steel manipulation methods mean that stainless steel can be cut, welded, formed, and fabricated easily. The flexibility of stainless steel cables, wires, and trellises means you can create just about anything into any shape or size. There are a variety of different grades of stainless steel based on their content of alloying elements as well as their mechanical properties and corrosion resistance, which can be exploited by the engineer and architect. Environmental factors need to be considered when choosing the grade of the stainless steel as this will impact its performance, durability and endurance in the environment where it will reside. There are methods to classify environmental factors which allow a grade to be chosen in any precise application. It is hardly known that the surface finishing of stainless steel has a similarly important role in defining the corrosion resistance. A disappointing performance of stainless steel can be a result of a poor quality polished finishing. Stainless steel is also easy to keep clean and which makes is cost efficient and hygienic, especially if used in children’s playgrounds. The application of stainless steel cables in the architectural and building industry can never be underestimated. Today stainless steel today is a practical, cost competitive and effective solution to many specific problems in the architectural, building and construction industries.